Proloquo2Go includes the VocaPriority™ feature. This system enables you to organize each folder’s vocabulary so that the most important and frequently-used words are quickest to access. The Primary Level appears when you first open the folder. This should include buttons needed very often, or which are very urgent when needed (e.g. allergies). To get to the Secondary Level, tap the More button in the bottom right corner of the grid. This should include words needed less often. The Storage Level is only visible in Edit Mode. Put vocabulary related to the folder’s topic that you are not yet ready to introduce here. We have also added suggested vocabulary to the Storage level of most folders. You may want to explore this and move some of these buttons to the Primary or Secondary level. 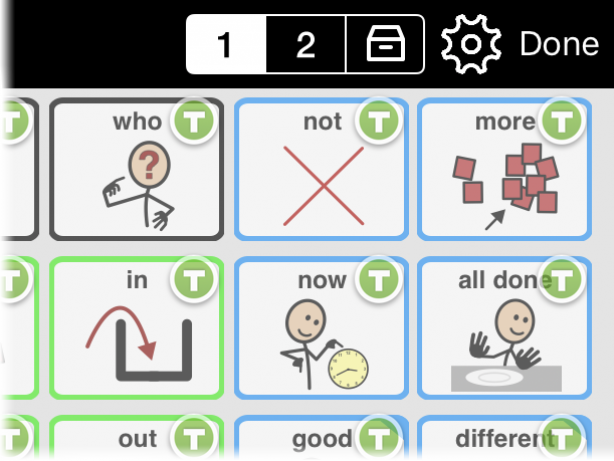 Users who can point or communicate ‘yes’ and ‘no’ can often participate in choosing words from Storage. In Edit Mode , you can use the Primary , Secondary , and Storage buttons in the top toolbar to view buttons in each VocaPriority level. You can also quickly move buttons between VocaPriority levels inside Edit Mode. First, select buttons by tapping them. Then, tap the Move to Primary , Move to Secondary , or Move to Storage button in the Edit Mode toolbar to move the buttons.